My child has a super-sized personality, despite her pint-size frame. Maybe it's because she was a preemie, or maybe she was always to be this way, but we have a hoot at the thing she does and says. As she grows, so too does her personality. It's funny to watch your kid's personality develop; Isabelle has always been a mover and a shaker - that is - she moves to any beat, and we didn't teach her that. She's a bit silly, too, and quite persistent. I love that about her. We've always been quite careful with how many toys and games she plays with, and enjoy toys that help her grow and develop, but also show this wonderful personality. We love watching her play with her dolls, changing their pretend diapers, putting them down for a nap. She already has a great imagination. When I was given the opportunity to review Fisher-Price's newest Little People characters, I knew Isabelle would love them. These tiny characters have great personality, too. Take Tessa: she's a spirited go-getter who loves animals, or Eddie: the sporty kid who always has a ball. Mia is delicate little lady who loves bows in her hair, and Sofie's inquisitive, curious and spunky. Missing from the lot is Koby - the silly jester who's done a little disappearing act! And this is where you have fun with your kid: take the Little People to the farm, the playground, the market. There are so many accessories and "homes" for these new friends. Or, you can play with them at your home - give them a bath in the dog bowl, snuggle under a blanket or go for a ride in the car! 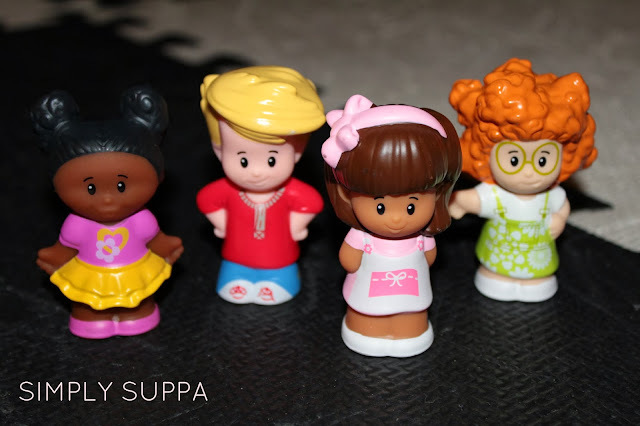 The Little People characters are animated and adorable, and they fit perfectly in the palm of my daughter's hand. I don't have to worry about any choking hazards or pieces that are too small. In October and November, Treehouse TV is holding the Little People, Big Discoveries contest. Play peek-a-boo and hide and seek with the Little People, watch a video and enter the contest to be entered to win 1 of 5 Little People Prize Packs valued at $265! To enter the contest, click here!